There are plenty of famous authors’ homes that have become museums. In such houses, visitors may gaze in reverence upon the great writer’s books and furniture, but they aren’t encouraged to linger, drinking in the atmosphere for hours. Usually they aren’t allowed so much as to sit in a historic chair. Fans of poet and novelist Rudyard Kipling, however, can do much more than simply visit the Nobel laureate’s home. They can actually spend their vacation in a house that he planned, built, lived in and loved. This is the house where he wrote the Jungle Books, Captains Courageous and other books and poetry, and began his work on Kim and the Just So Stories. Rudyard Kipling (1865-1936) was a British subject who was born in India during the Raj, the imperial era that he idealized and immortalized in verse and prose. Already internationally famous at 27, he moved to southeastern Vermont in 1892 after marrying Caroline Balestier, an American whose recently deceased brother had been Kipling’s dear friend. 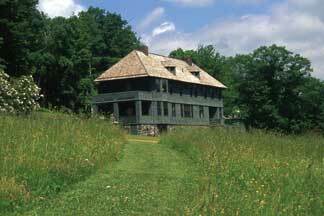 Today, after spending much of the 20th century sadly neglected, the home near Brattleboro, Vt., has been restored to life through the Landmark Trust USA. The great green house perches like an ark on a hill overlooking the Connecticut River Valley, with a distant view of Mount Monadnock. Kipling loved Naulakha’s sunlit central room with its big windows looking out at this prospect. “The joy of the house,” he called it. The Landmark Trust, a foundation based in the United Kingdom, preserves and restores notable British houses. Its work is funded in part by renting the homes to vacationers, and Naulakha was its first American property. It rents for a minimum of three nights at $250 to $435 a night, depending on the season. It’s booked well in advance for Vermont’s most popular months, such as August and October. Naulakha’s four bedrooms and three baths (all on the second floor) accommodate up to eight visitors, and its location makes it an ideal base for winter skiing or summer hiking vacations. 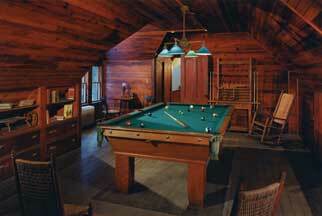 The house has a telephone and a modern kitchen, and there is a game room with Kipling’s billiard table in the attic. Guests are welcome to bring their children, and dogs are allowed, too. With all that room to romp on Naulakha’s extensive grounds, the kids might not even notice that there is no television. Rudyard Kipling’s four years in Vermont were productive, and happy for the most part. His elder daughter was born there in 1893: Josephine, her father’s Best Beloved. As a toddler, she was the first child ever to hear the tales that became his Just So Stories. While at Naulakha, the Kiplings had another girl, Elsie, in 1895. 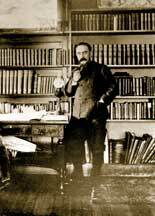 Kipling’s visitors included other renowned writers such as Owen Wister and William James. Sir Arthur Conan Doyle brought his host a pair of Nordic skis – said to be the first ones ever used in America. Kipling also built a tennis court, believed to be the first in Vermont. And he invented snow golf, using a ball painted red for visibility. For holes, he planted tin cans in the frozen crust that covered the snowy ground in sugaring season. Kipling dressed shabbily and spent what his neighbors thought was an inordinate amount of time playing games with his babies. He even had his wife handle his contracts, earnings and investments. Eventually, Carrie had a serious falling-out with her feckless, alcoholic brother, Beatty, leading to threats, a lurid lawsuit trial and much negative publicity. The stress of this family feud, with most of their neighbors taking Beatty Balestier’s side, meant that Naulakha was no longer a peaceful refuge for the Kiplings. 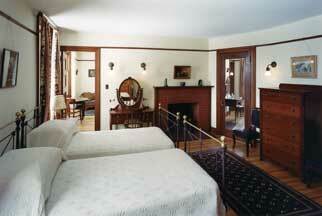 They left Vermont in 1896, taking only a few favorite furnishings, rugs, books and artworks. In 1899, 6-year-old Josephine died of pneumonia. Her heartbroken father couldn’t bear to return to the house where “my little American” had been so happy. In 1903 the Kiplings sold Naulakha to Mary Cabot, a family friend. Though subsequent owners added electricity and other changes were made, anything that was removed from the house was stashed in one of the estate’s barns. This Yankee thriftiness made the restoration of Naulakha considerably easier despite the fact that with the start of World War II, the house was uninhabited for five decades. Landmark Trust USA rescued it in 1992. The restoration took several years and hundreds of thousands of dollars, but Naulakha now looks remarkably as it did in Kipling’s day. One hundred and 10 years after he left, it’s easy to imagine that the man who built this special house would be immensely pleased if he could see Naulakha as it is now, with children once again at play upon his wide green lawns.